When parents send their children to school, they expect it to be a somewhat clean environment. Despite these expectations, schools are often full of germs and dirt. To keep children safe from illness, school cleaning should be taken seriously. With a new school year fast approaching, cleaning efforts should be in full swing. Confirm that an effective cleaning program is put into place to keep young minds ready for a new school year. Over the summer schools have had the chance to collect dust and dirt. Without the constant flow of children in and out of the buildings, the demand for consistent cleaning has greatly lowered. This may have caused a lag in cleaning efforts. It is time to catch up to the high school cleaning standards you have placed to give both students and faculty the environment they deserve. A fresh new year is best started when the building is shiny and new. Take the needed action now to get the school ready for the coming school year. Schools are full of shared surfaces, providing a breeding ground for germs. 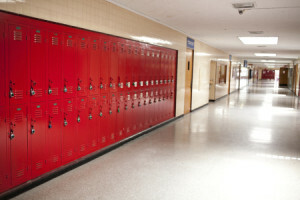 From desks to restrooms to lockers, students are constantly using areas one after the other. This creates the necessity of disinfection and sanitation. Bacteria and germs can easily be overlooked in the cleaning process. With so many students constantly moving throughout the school, spreading sickness is inevitable. Safeguard your school from a sickness epidemic through prevention rather than treatment once it comes. School cleaning is a constant effort. Children flood the hallways day in and day out, tracking in outdoor elements and leaving their germs to thrive. No matter the type of education facility, the need to share items and a clean up after people always exists. Do not wait until sickness strikes the masses. Take action now on the in-depth process of cleaning a school by hiring a professional cleaning service to do the job right. Jani-King has been cleaning schools for over 30 years, making them an experienced group of professionals. They understand the importance of school cleaning to start the school year on the right foot. With their thorough background checks, insurance policy and dishonesty bond, Jani-King provides a trustworthy service for your cleaning needs. If you are looking for the best cleaning service for your school, give the Jani-King professionals a call today!